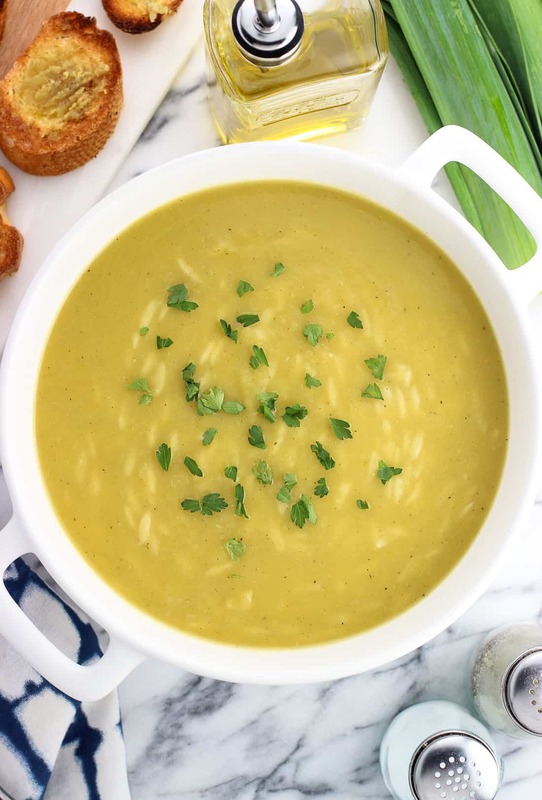 This healthy potato leek soup with orzo is thick and creamy without cream – or even milk! 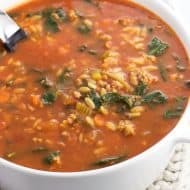 Orzo gets added to the soup near the end of cooking for a hearty addition to this easy soup recipe. It’s hard to argue with a warming, hearty bowl of soup on a chilly night. Especially when it’s on the healthier side at that. 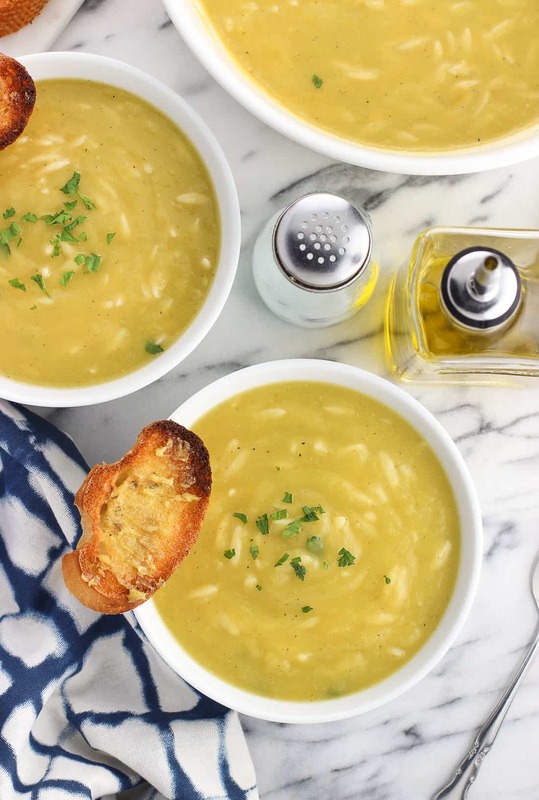 This healthy potato leek soup with orzo is comprised of simple ingredients there’s a good chance you already have in your kitchen. Except for the leeks, which I’ll be honest, I rarely cook with outside of potato leek soup. 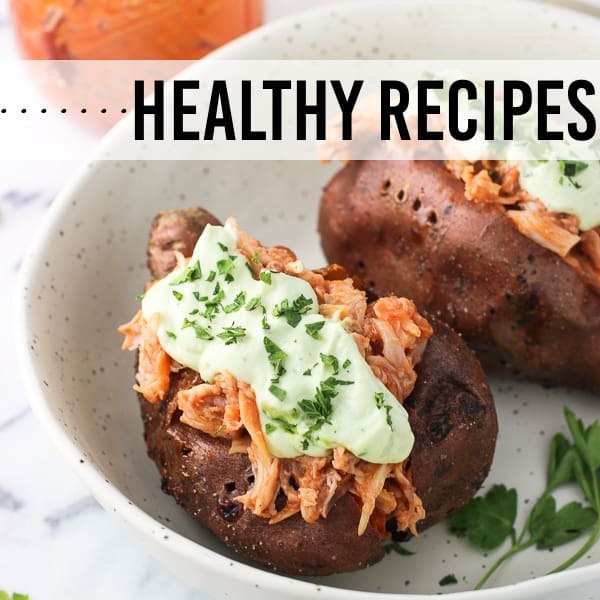 Here though they add a mellower onion-ish flavor that pairs wonderfully with potatoes, broth, and simple spices. 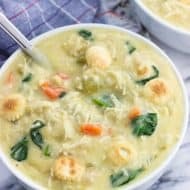 Creamy yet healthy potato soup isn’t anything new around here, as this potato and white bean soup with kale has proven to be a reader favorite. It’s one of my favorites, too. Leeks require a little bit of prep work to get them ready for cooking, and I start with the leeks unwashed. After slicing off the dark green part and the very bottom bit, you’ll be left with the light green and white part of the leek. 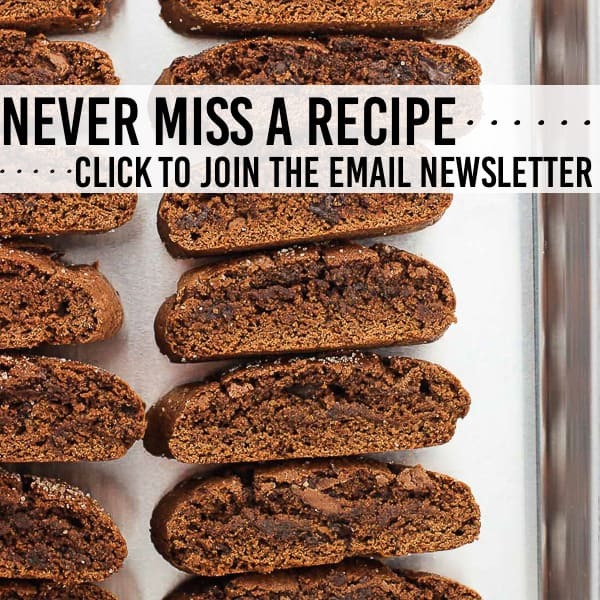 Slice this part in half lengthwise. 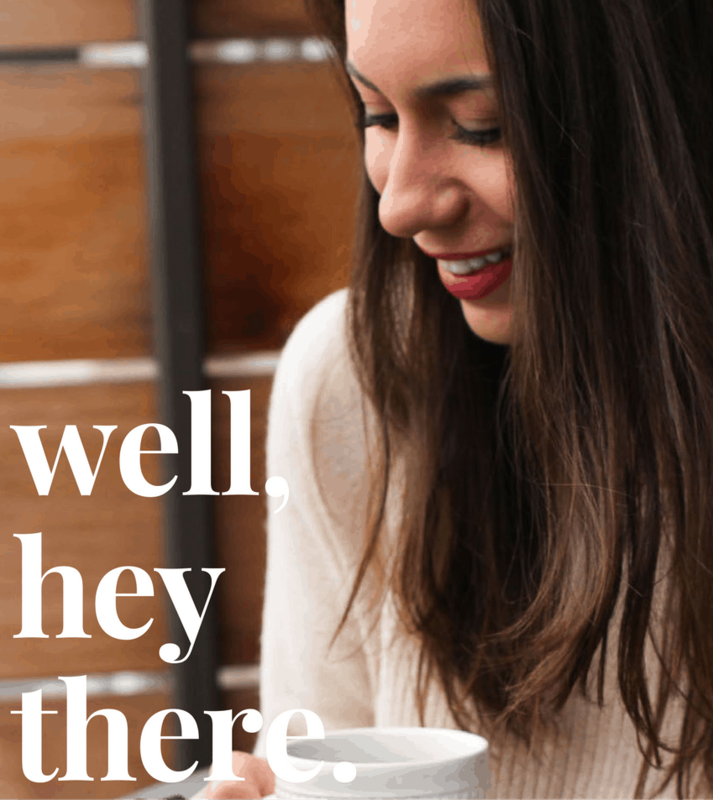 You’ll notice each half features a bunch of layers. Placing the cut side down, slice each half into thin sections and place in a large bowl of cold water. 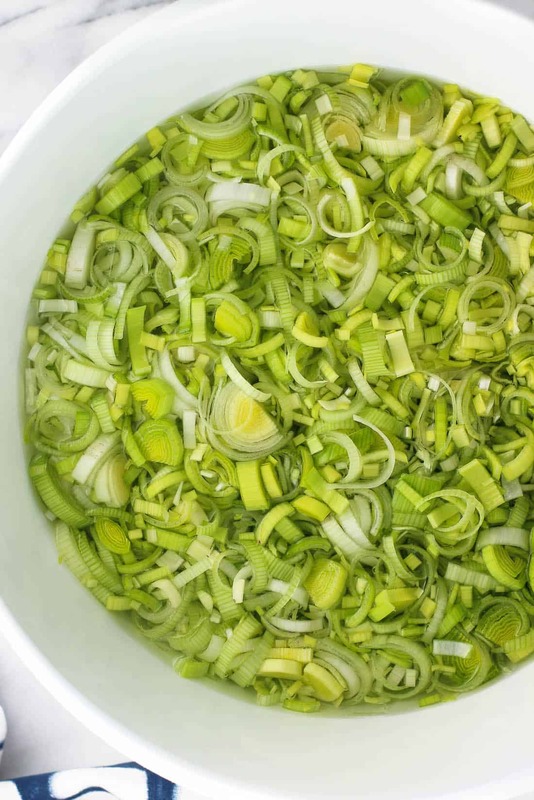 Once all of the leek slices are in the bowl, separate out each slice with your hands and gently shake the pieces in the water to wash away any dirt that was hanging out between the layers. Once all separated, lift out the leeks and place them on another dish to pat dry. Doing it this way (versus pouring everything out through a strainer) helps ensure the dirt remains settled on the bottom of the bowl and doesn’t make its way in with the sliced leeks. After a quick saute with onion and garlic, broth and the potatoes are added and boiled until the potatoes are tender. One of the main VIPs of this potato leek orzo soup recipe comes in handy next, which is an immersion blender. 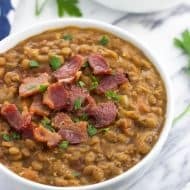 For years I’ve been transferring hot soup one ladle at a time to my blender to puree, and then being annoyed that I created more dishes for myself to wash. And not just any dishes but the blender, which ranks up there with that huge pastry mat with the circle measurements and cooling racks as the worst kitchen items to wash. An immersion blender (affiliate link) solves that dilemma. 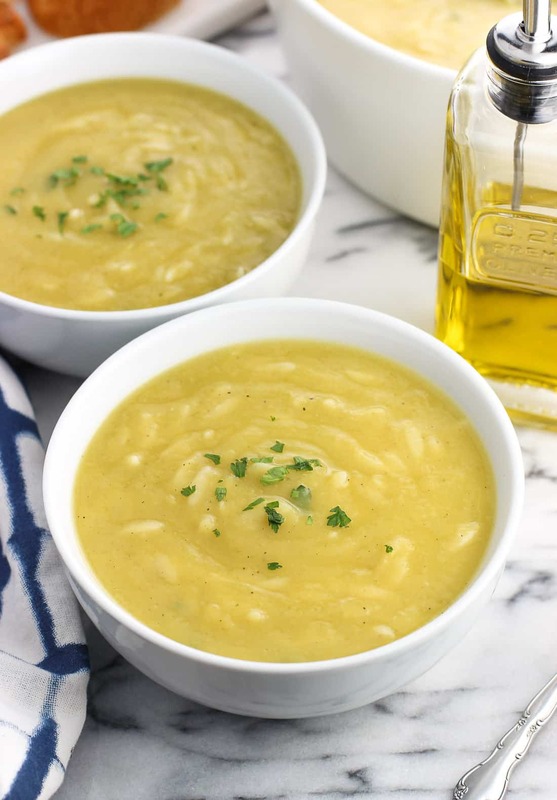 Orzo is a less-than-traditional addition to this healthy potato leek soup, but provided a nice change of pace as far as texture goes. The best thing about this part is that the dry pasta is added directly to the soup once it’s blended, then left to simmer for ten or so minutes until the pasta is cooked. I’ve seen recipes that call for setting up a second pot of water in order to boil the pasta and then add the cooked pasta to the soup, but again, more dishes?? No thanks! 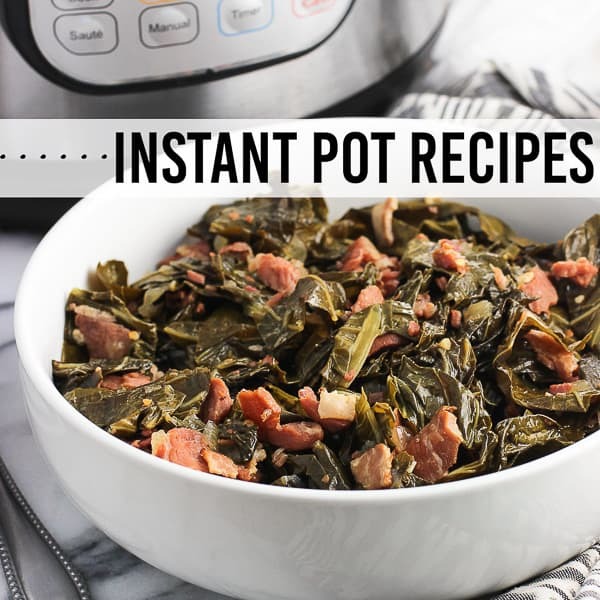 It’s really easy to cook it right in with everything. 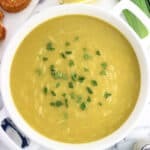 I’m partial to using yellow (or gold) potatoes in this healthy potato leek soup as I find they add an extra bit of richness, however you can use whatever variety of potatoes you prefer in soups. When buying leeks from the store, ideally you’ll want to choose leeks with the largest white and light green sections, as that’s the area you’ll be cooking with. After you blend the soup, add the seasonings below, or to taste. I kept it simple with salt and pepper, but feel free to add whatever spices you like. 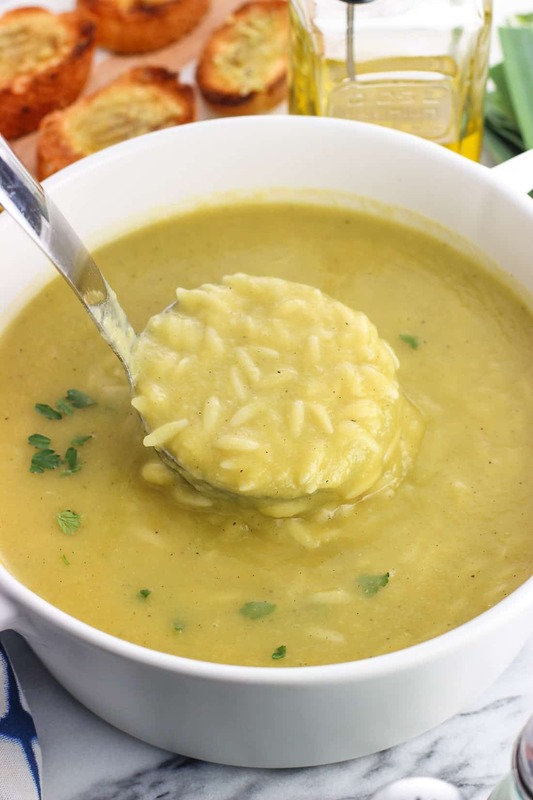 You can omit the orzo if you’re not feeling it, but it gave an otherwise homogenous soup some texture we really enjoyed. First prep the leeks. Cut off the dark green tops and the very root ends, leaving the lighter green and white part. Cut that part in half lengthwise. Slice each half into thin pieces and place the pieces in a large bowl. Fill the bowl with cold water and break up the leek slices with your hands, sloshing them around the bowl to remove any dirt. Remove the leek pieces to a separate bowl or plate with a strainer or your hands and pat them dry. Add 2 tbsp olive oil to a soup pot set over medium heat. Add leeks and saute for 5 minutes, occasionally stirring them around. Then add remaining 1 tbsp of olive oil and then diced onion. Saute for 3-4 minutes or until onion becomes slightly golden. Add minced garlic and saute for an additional 2 minutes. Pour in broth and raise heat to medium-high. Stir in cubed potatoes. Once soup reaches a boil, lower heat and simmer soup for 20-25 minutes, or until potatoes are tender. 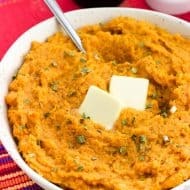 Blend soup until creamy, either using an immersion blender or by carefully transferring batches of the soup to a blender and returning to the soup pot over medium heat. Once soup has been blended, add salt and pepper to taste. Add orzo and cook for 10-11 minutes, stirring occasionally, until orzo is tender. 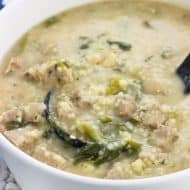 Chicken or vegetable broth would work well in this soup. All vegetable will keep this soup vegetarian. I usually have an open broth container in the fridge, so in one instance I've combined chicken/vegetable in one pot of soup and it was delicious. In that instance I used 2 cups of vegetable stock and 4 cups of reduced-sodium chicken broth. Use what works for you! 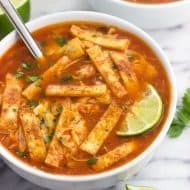 This soup sounds right up my alley! I love adding orzo to soups. And I couldn’t agree more about the immersion blender making it SO much easier to puree soups. I just used mine last night to make a spring veggie soup with asparagus puree (which also contained leeks! ).